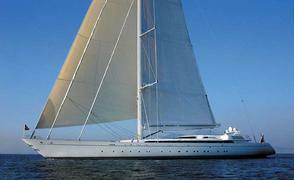 Hearing that there'd been a price reduction to the 75.22m sailing yacht Mirabella V, I call her joint central agent, with Georges Bourgoignie, Bill Sanderson at Camper & Nicholsons in Palm Beach who confirms that the price has been cut by a massive €9.1 million. Mirabella V is a superyacht in every sense of the word. She is the largest single-masted sailing yacht in the world, and holds the world record for the largest sail and the tallest mast. She has a very spacious interior that can accommodate up to 16 guests in a master suite, four doubles and two twins plus two Pullman berths. Delivered in 2004 by Vosper Thornycroft to a Ron Holland design, she’s proved to be a very popular charter yacht. She featured in the 2005 edition of The Superyachts book. Her asking price is now €39.9 million, down from €49 million and Bill asks me to mention that the seller is 'highly motivated'.